Backgammon is a hugely popular board game around the world, especially in the Middle-East countries or countries across the Mediterranean, particularly Greece and Crete. In Greece, backgammon, known as “Talvi“, is almost considered like a religion. You will often see old men and also the younger generation playing backgammon in the small little local cafes over there. 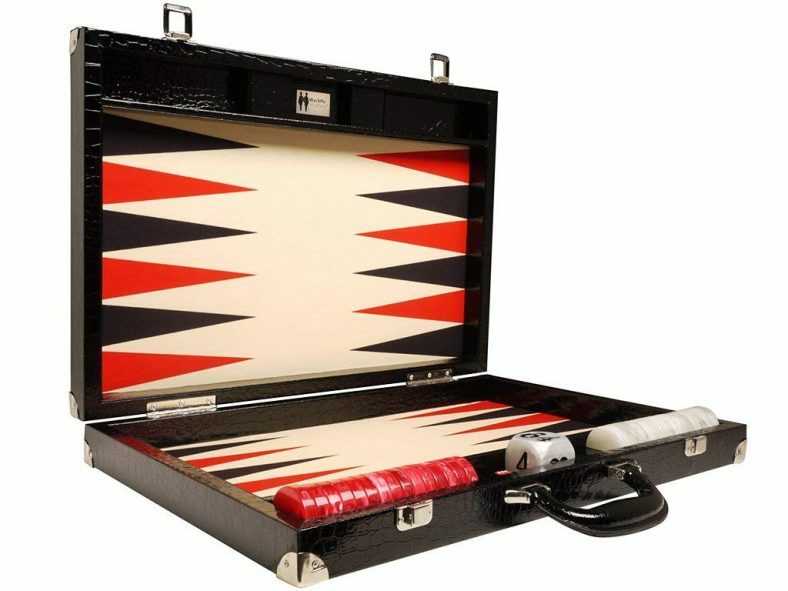 There is a lot of backgammon variants but they all have one thing in common: The backgammon board.You can find all types of backgammon boards, made with all type of materials, colors and styles: leather backgammon sets, wooden backgammon boards,felt, cork or vinyl backgammon boards, tournament backgammon boards, portable backgammon set or travel backgammon board. Like everything else, if you are looking for the best backgammon board, or at least for a high quality backgammon board, you will get what you are paying for. If you are passionate about backgammon, you can pay several thousand dollars for a beautiful backgammon board made of fine materials. Those luxury backgammon boards play very well and will last long. But of course, the average backgammon player won’t want to invest that kind of money into a backgammon board, and thankfully you can find great backgammon boards at more reasonable price. 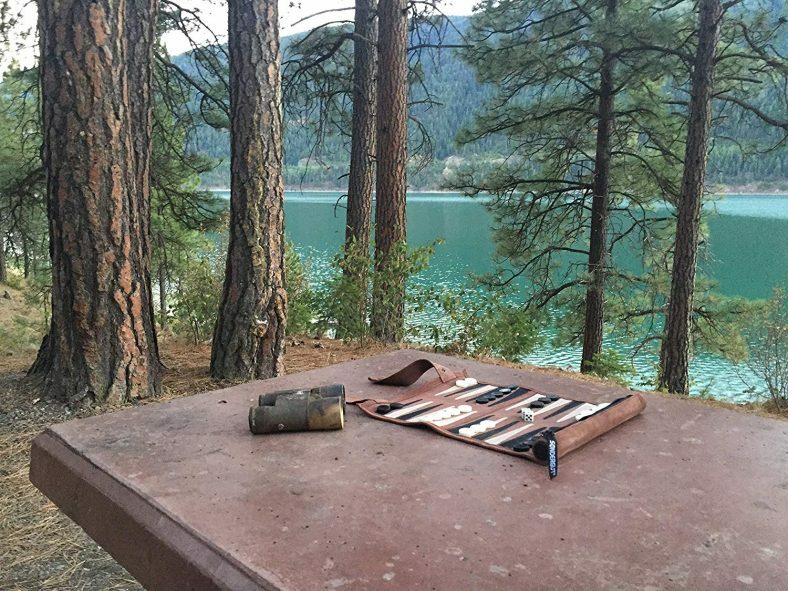 Backgammon design: Attaché or table top backgammon board? 5/8" high gloss black and white dice. Backgammon Board, Playing Chips, Playing Dice, Doubling Cube, Dice Shakers and Exclusive Strategy & Tip Guide by Get the Games Out (Trademarked). Includes spare chips and playing dice of each color. 13' Wood backgammon board (both the playing surface and exterior surface). 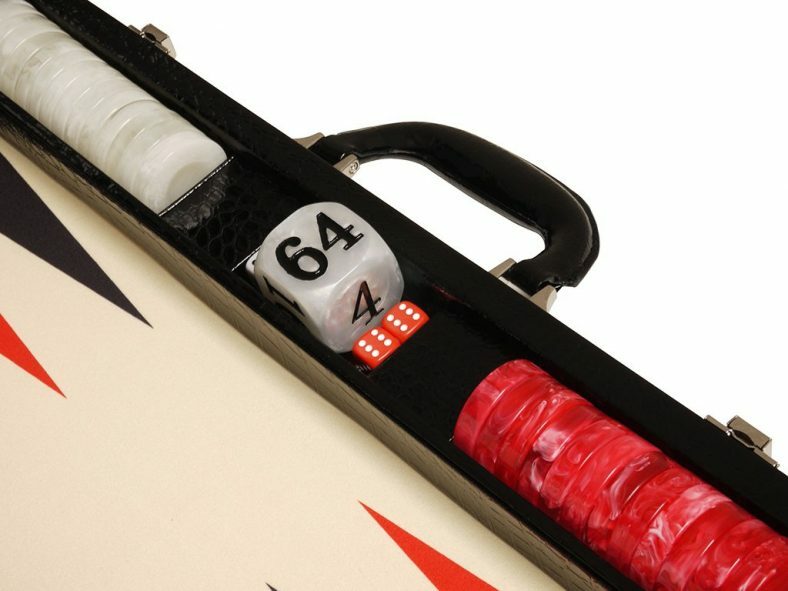 Folding backgammon board ideal for travel with all accessories inside. 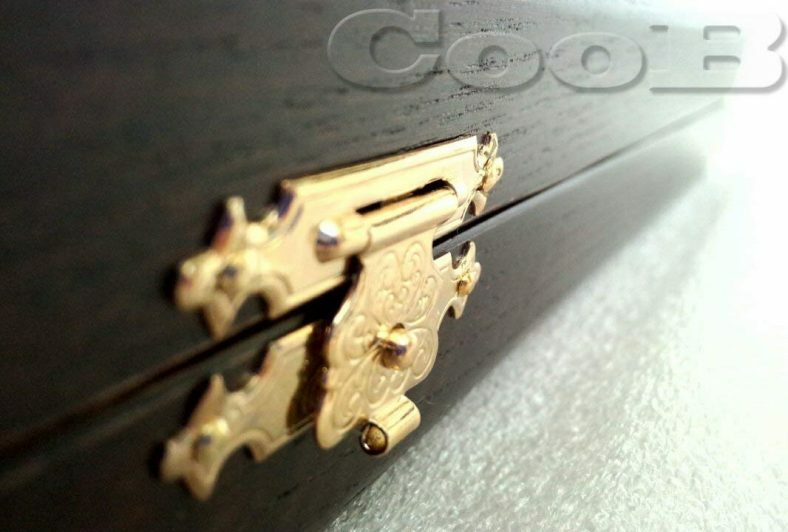 Piano Lacquer Finish Secures With Shine: Hidden inset magnets to keep the Backgammon set firmly closed. Also included are 4 dice, a doubling cube, and 2 wooden dice cups. Board size is 10 x 12-2/3" but rolls up to the size of pocket umbrella. Weighs less than 1/2 a pound. Great for travel. 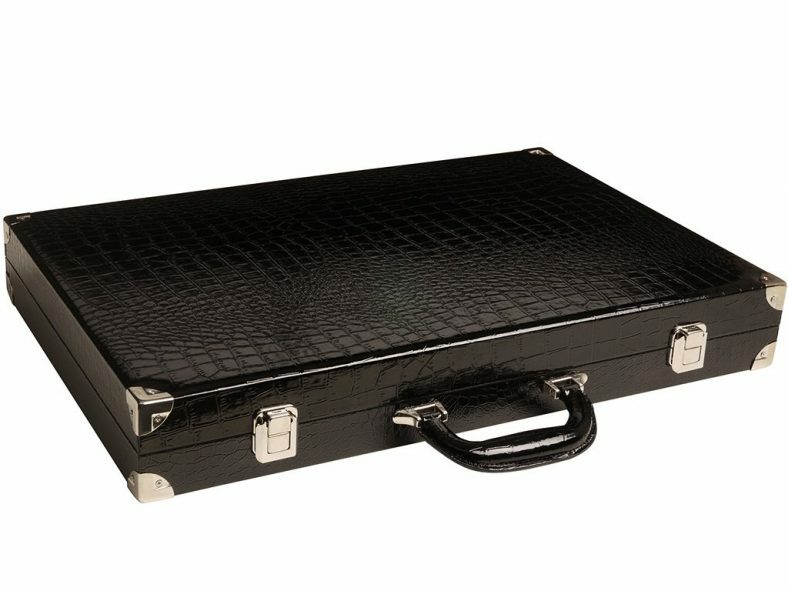 The backgammon case is finished with premium leatherette. It looks really good. It comes in different color scheme. The hinges are strong and sturdy. 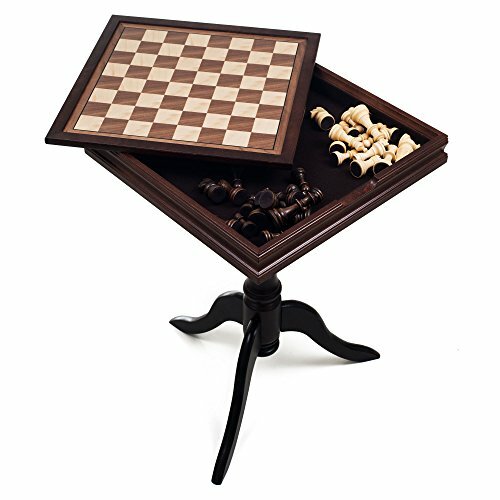 You will also appreciate the way you can fit the checkers nicely in the storage compartments. When the case is closed, everything stays in its place inside. The backgammon carry case makes it perfect when you want to travel along with your favourite games. The playing surface is a nice smooth padded felt. I can guarantee you that there is no chance to feel the point or any seems if you run your fingers across that felt playing surface. 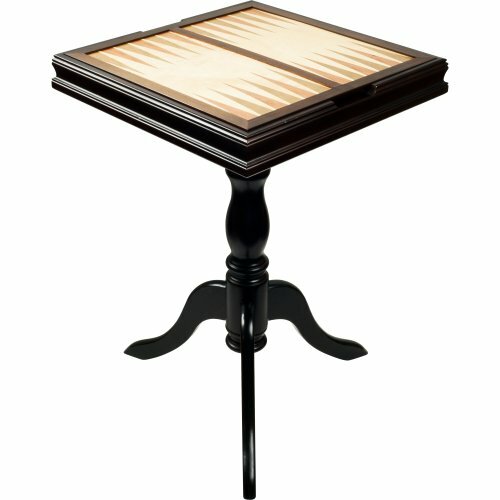 It is nicely made with good cushioning and provide a nice glide for the checkers. To clean the felt you can use an adhesive lint roller, it works well. The checkers are very hefty, solid checkers made of melamine. They are a full 1.5″ diameter (32 mm) and 3/8″ thick (11 mm). They fit perfectly in the home board, with minimal gap when side by side. The oval dice cups are lined with that same smooth felt to reduce the noise when rolling the dice. Each set also comes with a large 1″ doubling cube and 5/8″ high gloss black and white dice. 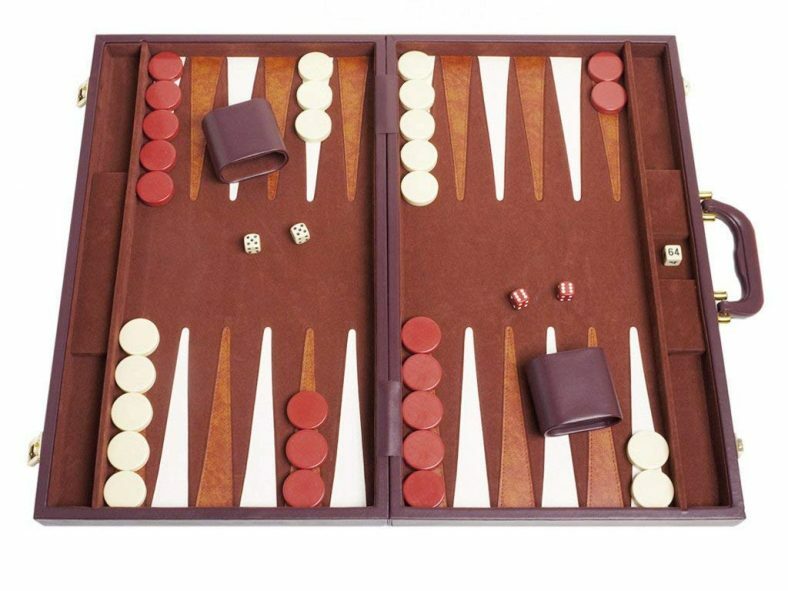 Overall this a Silverman & Co board is a beautifully crafted backgammon set, very well made and well-priced. It feels very luxurious and play very well. 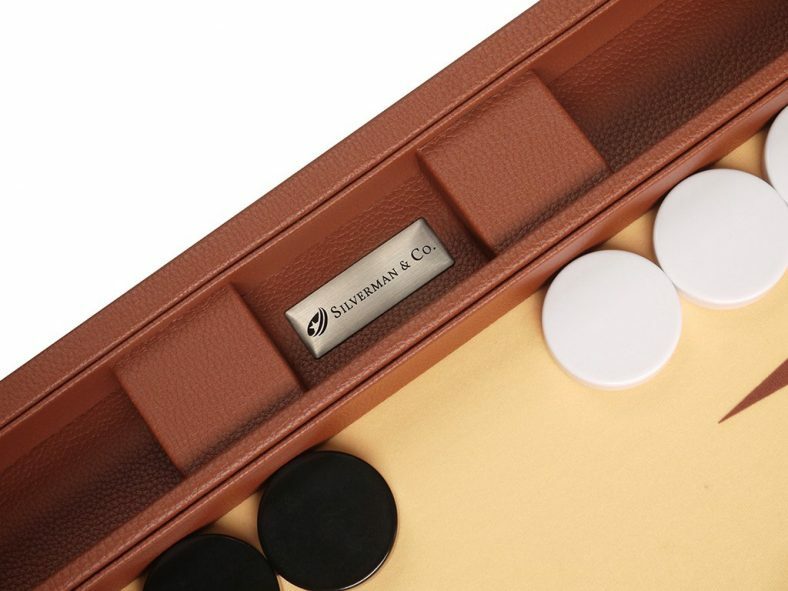 So, if you are looking for the best leather backgammon set, this Silverman & Co backgammon board is my top recommendation for you. You won’t regret it! The runner up for the best leather backgammon set is the Middleton Games leather backgammon set. 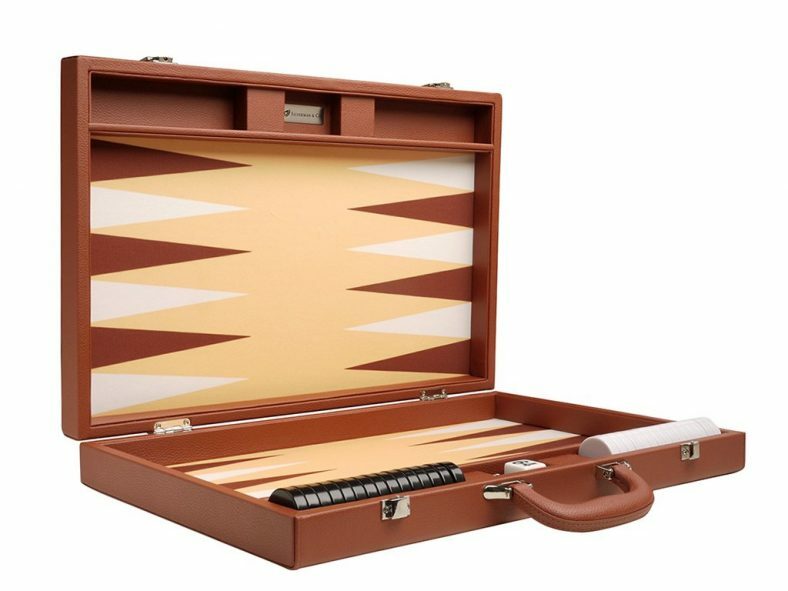 This specific model is a classic full-sized 21 inches tournament backgammon set priced at less than $100. Really a great bargain for the quality of that set. Of course, if you prefer a smaller playing surface, Middleton Games provides also a 18″ or a 15″ sized boards in their range of product. 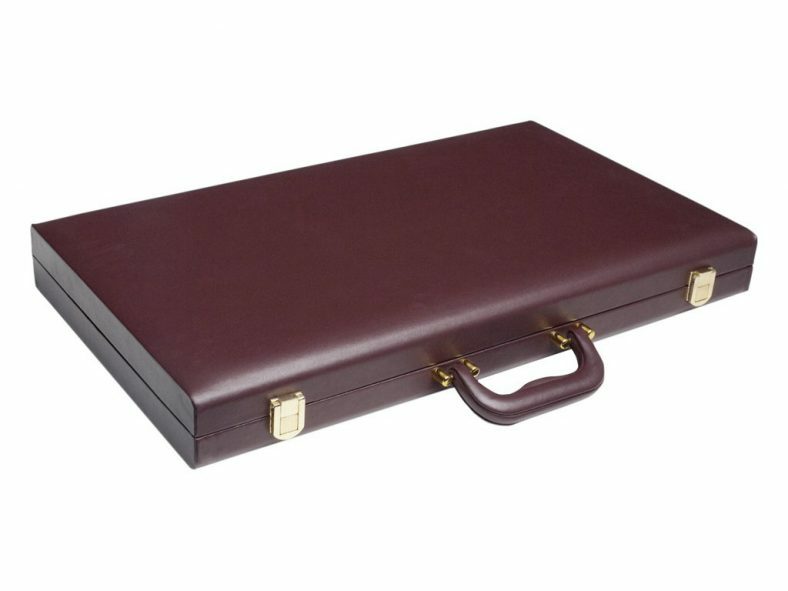 The carrying case is made of nice brown simulated leather with solid brass clasp and a nice sturdy handle. It makes it easy to carry it around. The field material is made off faux suede felt that gives the board a real professional look and feel. That felt lining will also reduce the noise when rolling the dice. The checkers and the dice are of good quality, they have a good feel to them and a nice weight.Checkers are made of uria stone and are exactly 1.5″ diameter, and 3/8″ thickness. The exterior of the dice cups are covered with the same simulated leather than the carrying case. They look great but I would have liked them to have trip lips on the edge for better dice rolling. The bottom of the cups are covered with the same felt than the playing area. 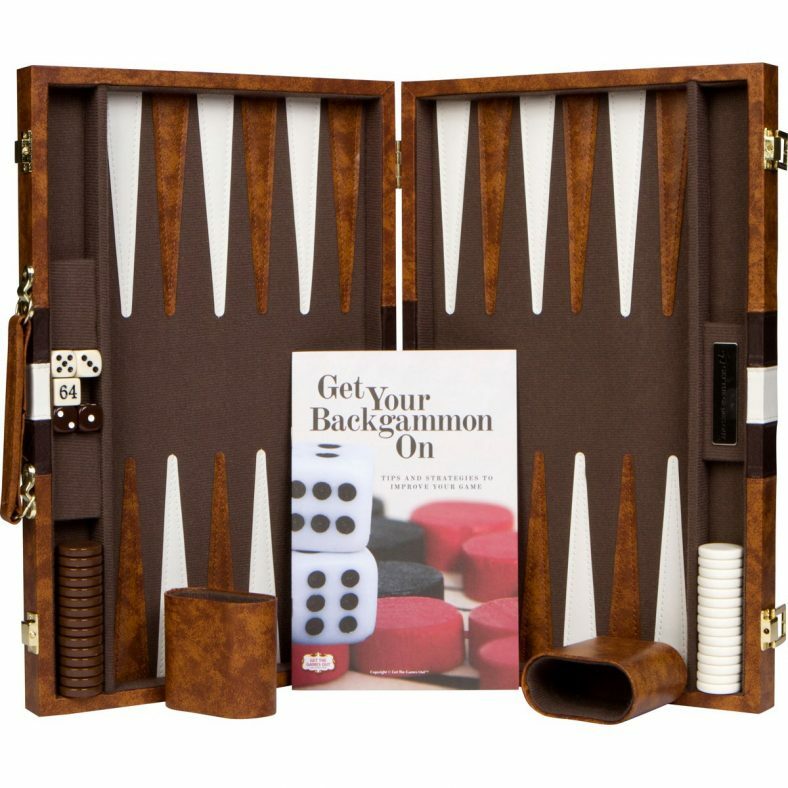 If you are looking for the best leather backgammon set with a large sized playing surface, for less than $100, the Middleton games 21 inches tournament backgammon set is a great choice. 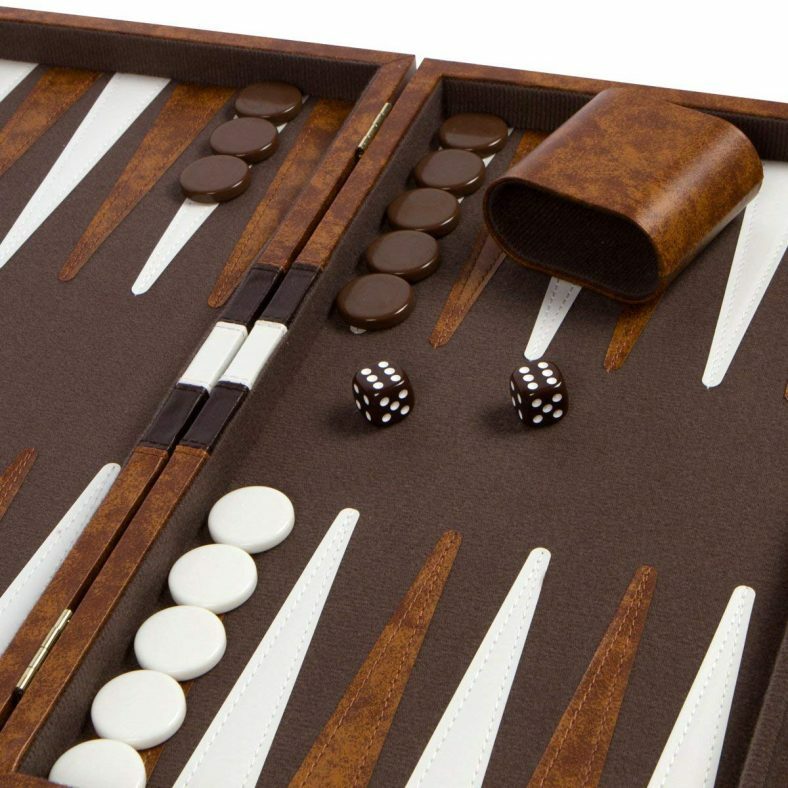 It is a great backgammon board and it won’t break the bank! WHAT'S INCLUDED: Backgammon Board, Playing Chips, Playing Dice, Doubling Cube, Dice Shakers and Exclusive Strategy & Tip Guide by Get the Games Out (Trademarked). Includes spare chips and playing dice of each color. 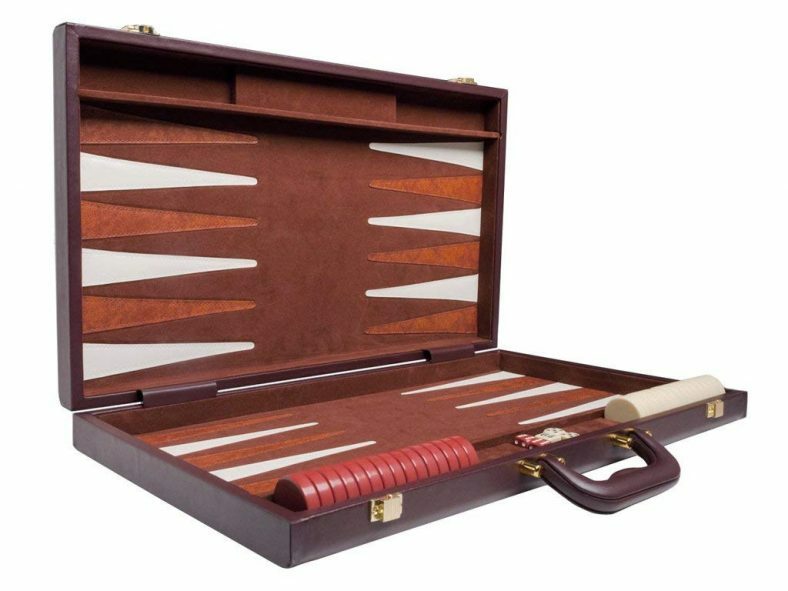 This leather backgammon set is my top pick if you are in a budget or if you are new to the game and want to get a feel for it without investing too much money into it.The Games Out Top Backgammon Set is available in 3 different sizes: 11 “, 15” or 18 “. 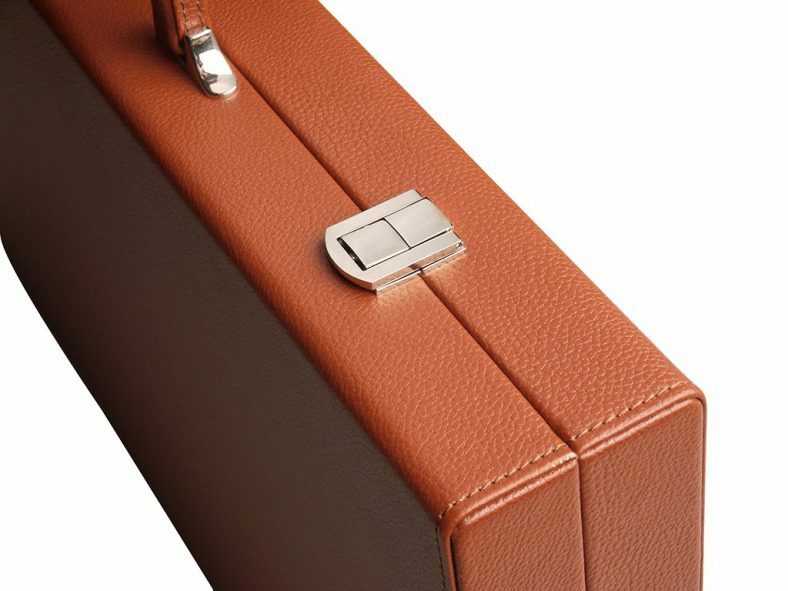 The carrying case is is a leatherette carrying case, with clasps that hold it together well. When the case is closed, the checkers and dice are held securely inside. It makes it perfect for traveling. The playing surface is made of felt and the points are sewn down in a manner that assure the points lie flat. The checkers are made of hard resin and feel nice in the hand. You get a spare checker for each color which can be handy. 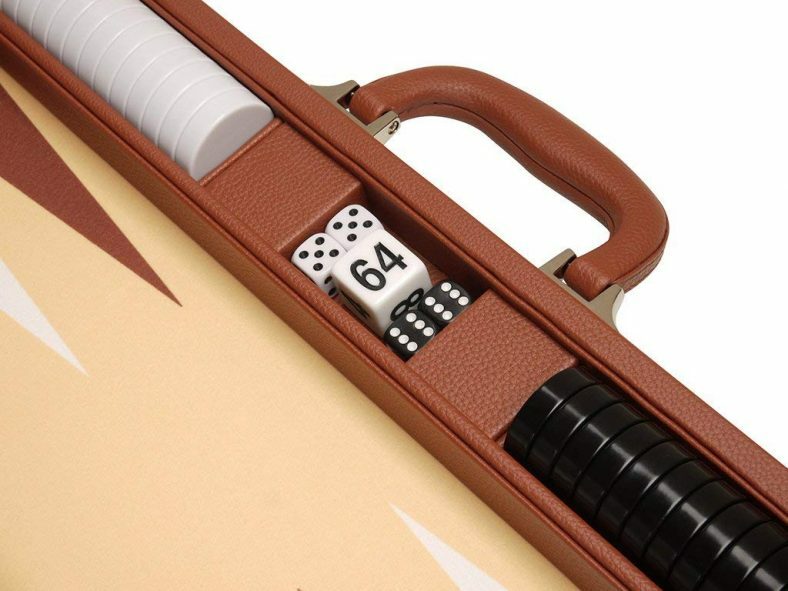 This leather backgammon set comes with dice, dice cups, doubling cube, checkers (with spare!) and also includes a sheet of rules and another sheet with playing strategies. Would be a perfect gift for someone wanting to start playing backgammon. Overall, this might not be the best leather backgammon game around but it is certainly the best choice if you are in a budget and looking for a backgammon set that is well made and has absolutely everything you need to get going. 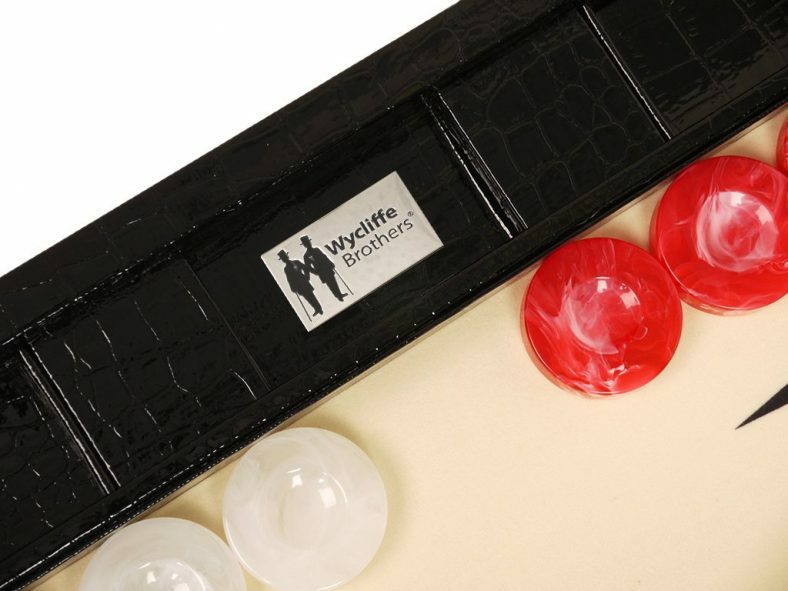 This is the 3rd generation series of the Wycliffe Brothers beautiful luxurious backgammon sets. 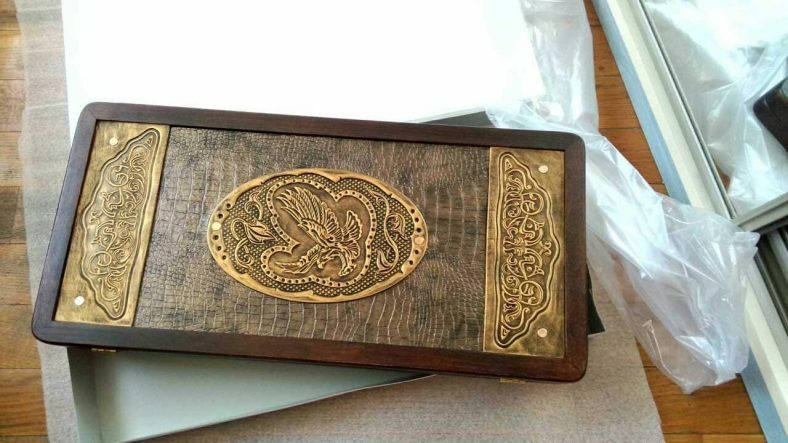 There is so many things to say about this exquisite backgammon board. It is a bit more expensive than all the previous models on this post but if you have the budget and you are looking for an high quality backgammon board, it is worth every penny,this is for you. 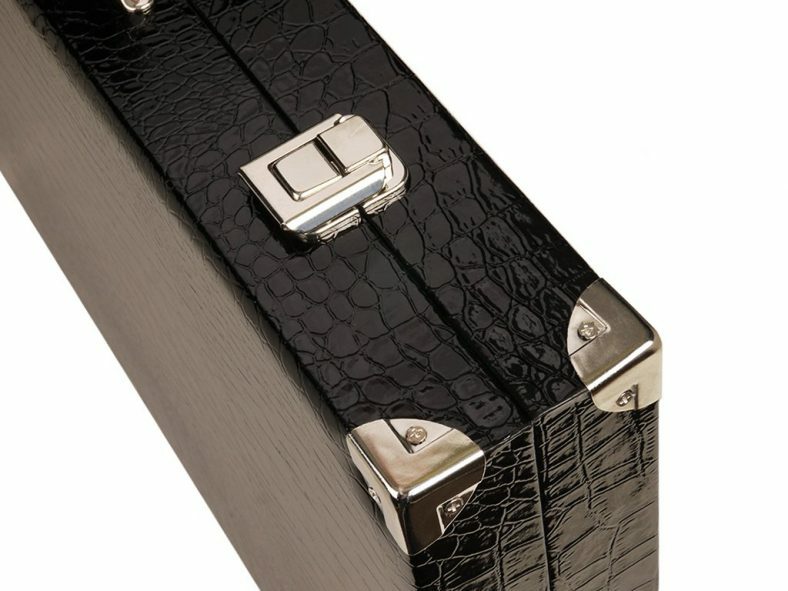 First the carrying case is made of stunning faux croco material and is equipped with very nickel plated latches and a reinforced luggage-style handle. 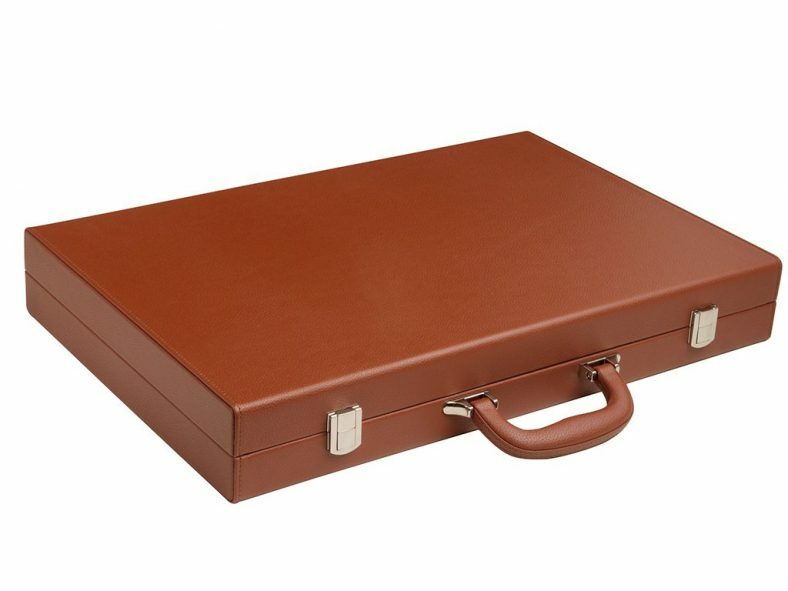 The case measures 53.5cm x 37cm closed (21″ x 14.25″) and is robust and sturdy. The 21″ large playing surface is made of high quality felt surface know as V-Fiber. 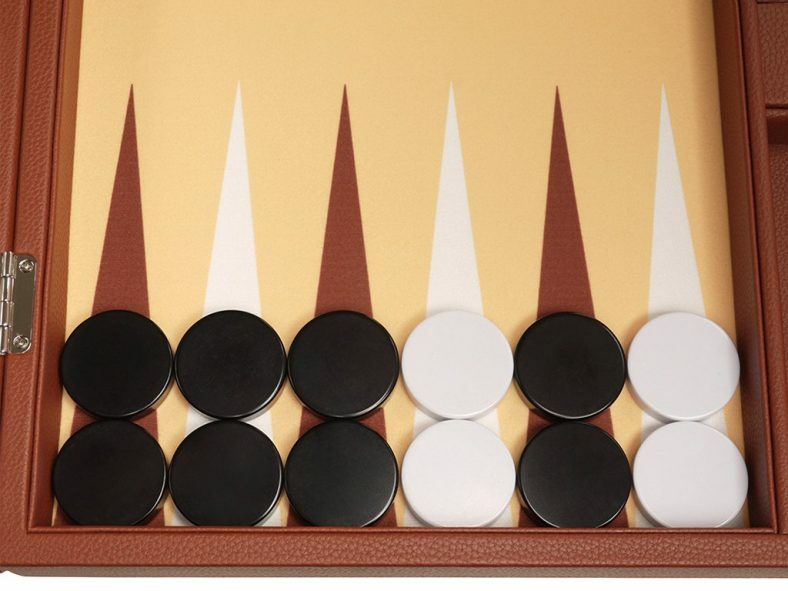 It is extra smooth and allow the checkers to glide effortlessly but it also offers the perfect amount of friction to keep the checkers in place if you happen to move the board accidentally. The oversized high gloss marbleized checkers are beautiful and are very heavy, weighing a hefty 20 grams each! They feel great to play. They measure 1 3/4″ (44.5 mm) diameter and are 7/16″ (11 mm) tick. Very nice indeed. 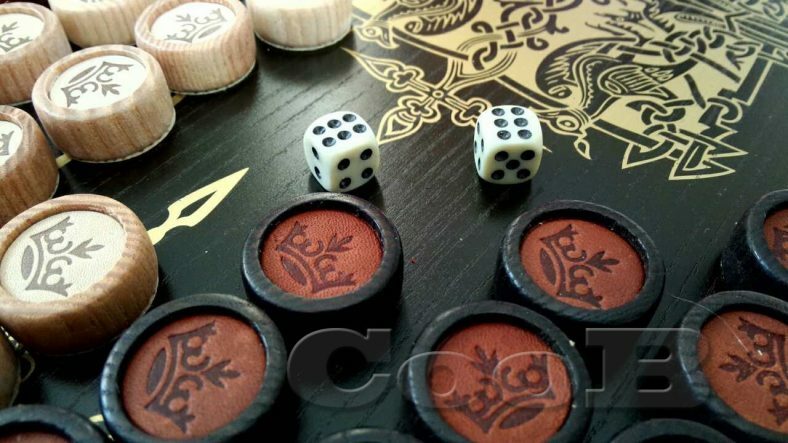 With this high quality backgammon board, you will get professional dice cups with tournament grade trip lips (for fair dice rolling) , that can be handle very well, with that ultra smooth V-Fiber felt lining inside to reduce noise from the rolling dice. You will get also a huge 1 3/4″ doubling cube. 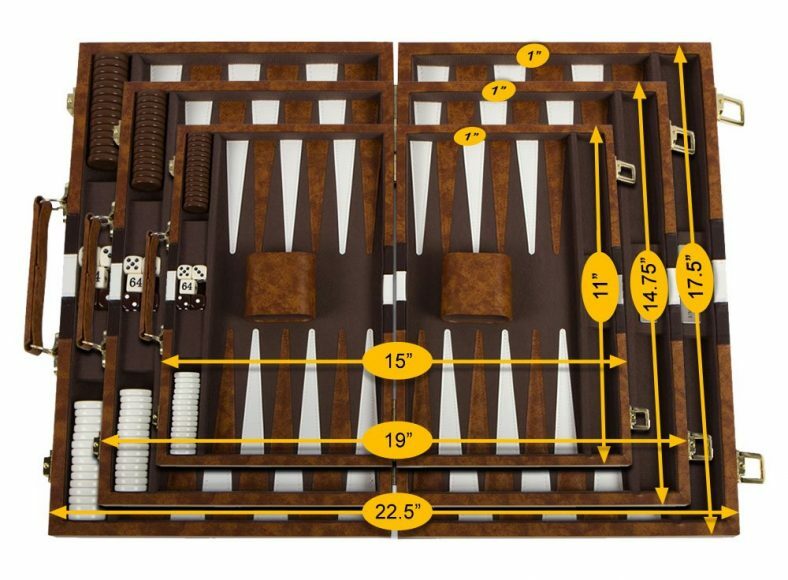 Everything about this high quality backgammon board is refinement and luxury. And still, it comes at an affordable price. To resume: Great product, good price, excellent quality. This full tournament size 21″ wooden backgammon board is a bit different than the previous models. As you can see on the pictures, it looks rather like a piece of art. 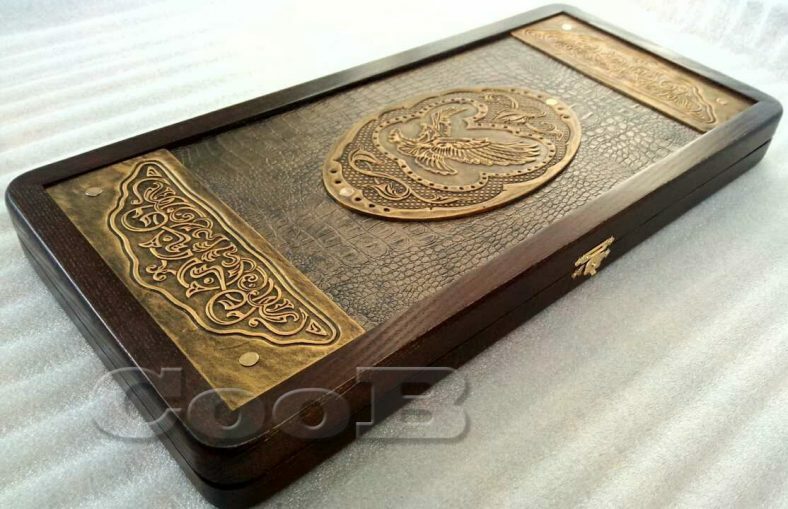 This high quality backgammon board from Ukraine is made with a mix of wood and leather materials. 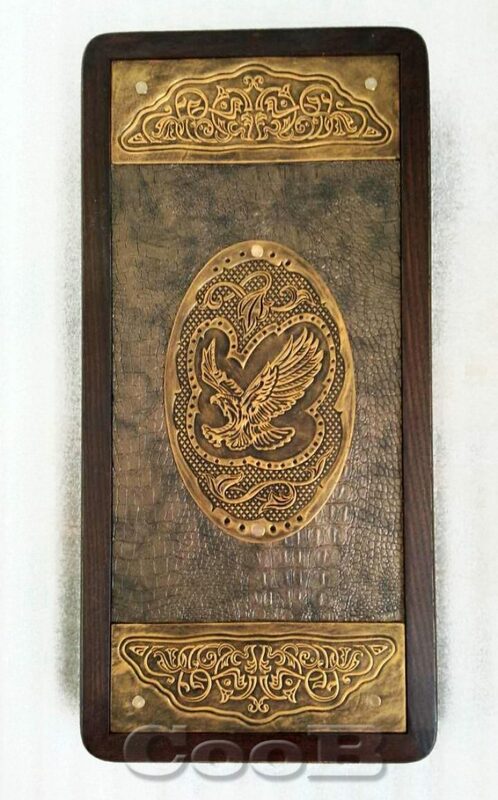 The Golden Eagle at the front of the case is made of natural leather pressed to give that stunning look. This is a beautifully handmade product: The playing surface is wood and the exterior of the case is leather.The checkers are made in wood too, with some leather in the middle of them. Rather unique.The dice are a bit small though, so you might want to replace them if you are use to play with bigger dice Not a big deal though. 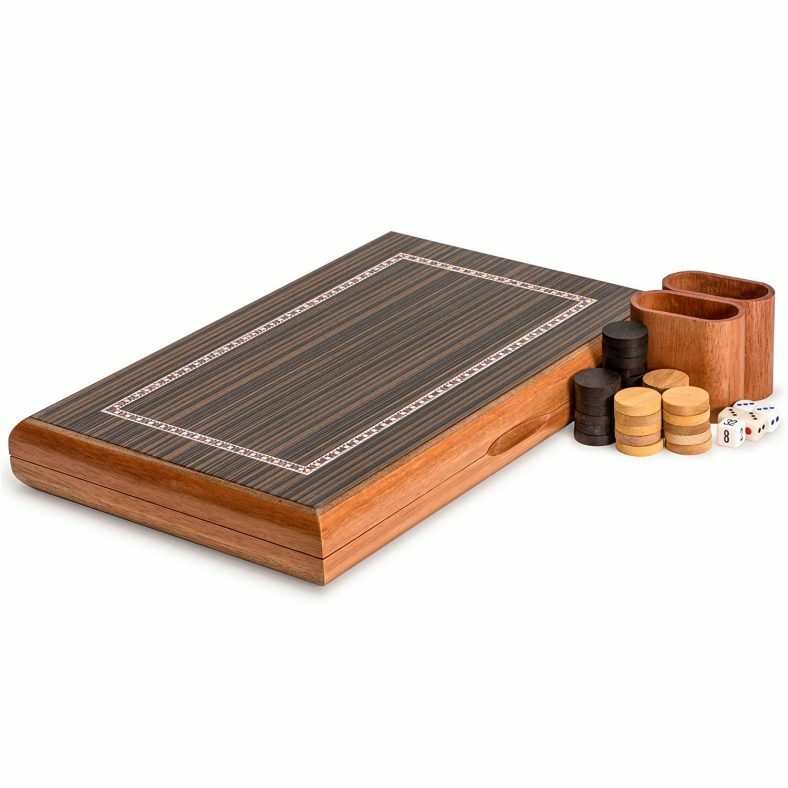 This backgammon set comes also without dice cups as it is apparently not the custom to use them in eastern Europe when playing backgammon. 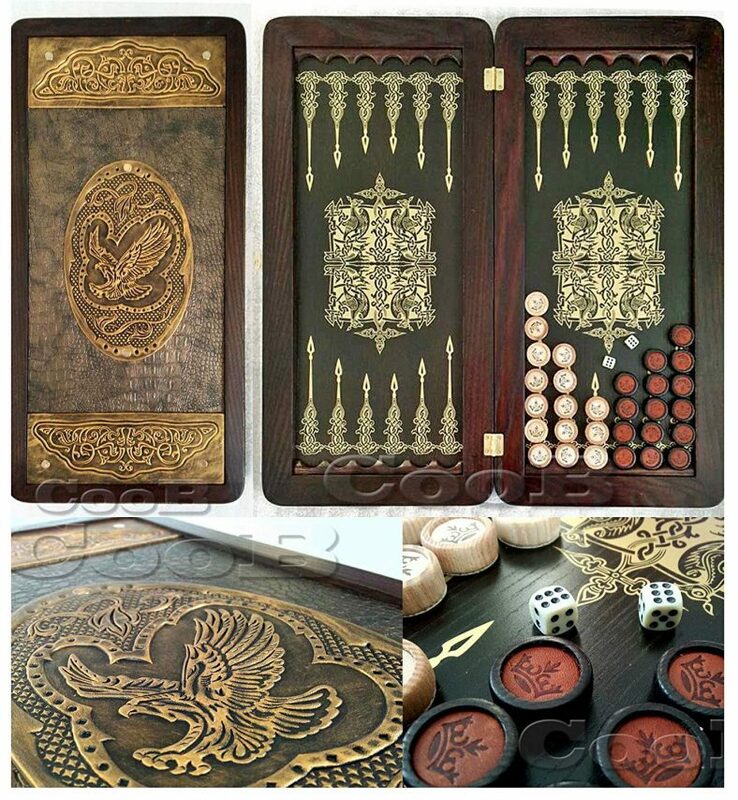 This is a sturdy and beautiful backgammon board with an excellent craftsmanship. 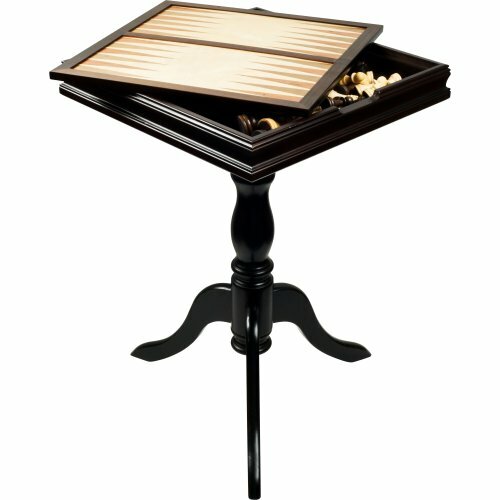 This is really an unique top quality backgammon board that you will both enjoy playing and exposing in your house as a decoration. Beautiful Inside And Out: The level of detail on the Backgammon wood inlay (on both the playing surface and exterior surface) speaks to its superior craftsmanship. 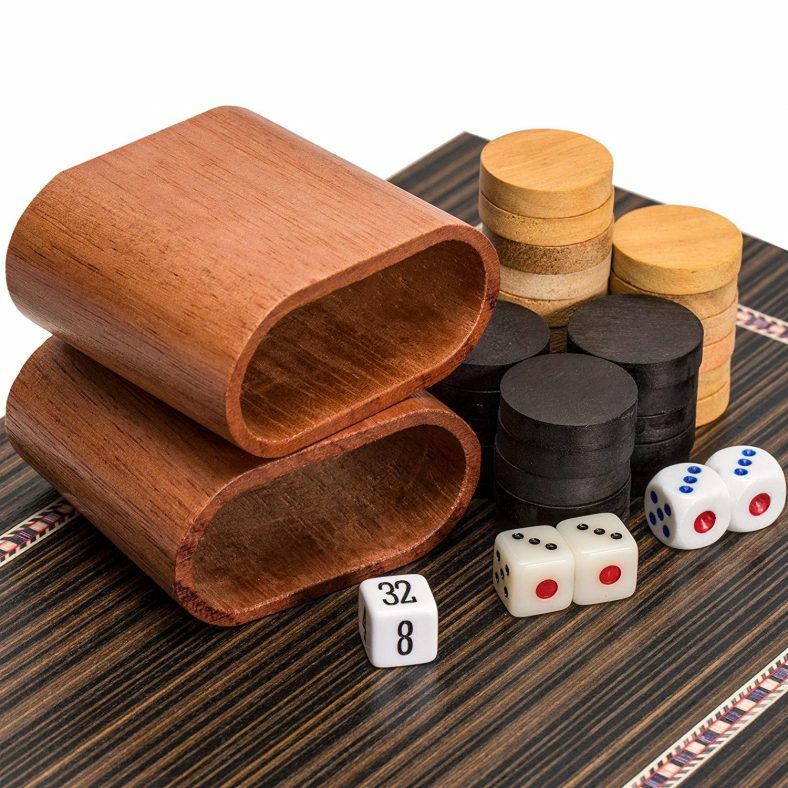 Folding Board For Travel: Even though the Backgammon board wood is dense, the set conveniently folds in half with all accessories inside, for a truly easy to carry set, with dimensions when closed measuring 13 x 8.25 x 2 in (33 x 21 x 5 cm). This 13″ wooden backgammon board looks amazing with its luster of piano lacquer. The backgammon wood inlay on both the carrying case and the playing surface looks and feel really luxurious. 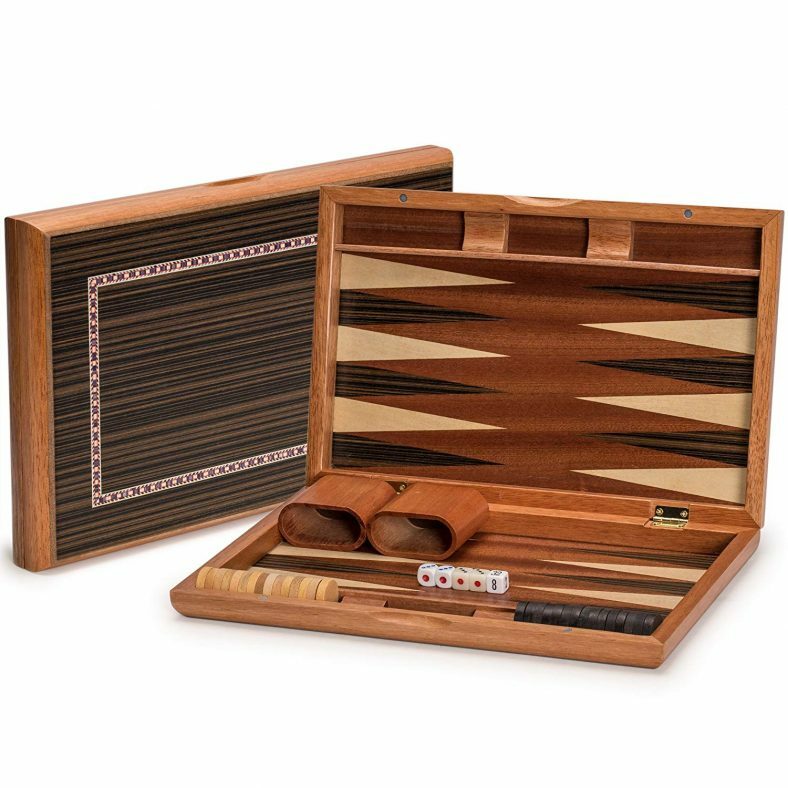 This small wooden backgammon board conveniently fold in half and has two hidden inset magnets to keep the backgammon case securely closed when you travel. 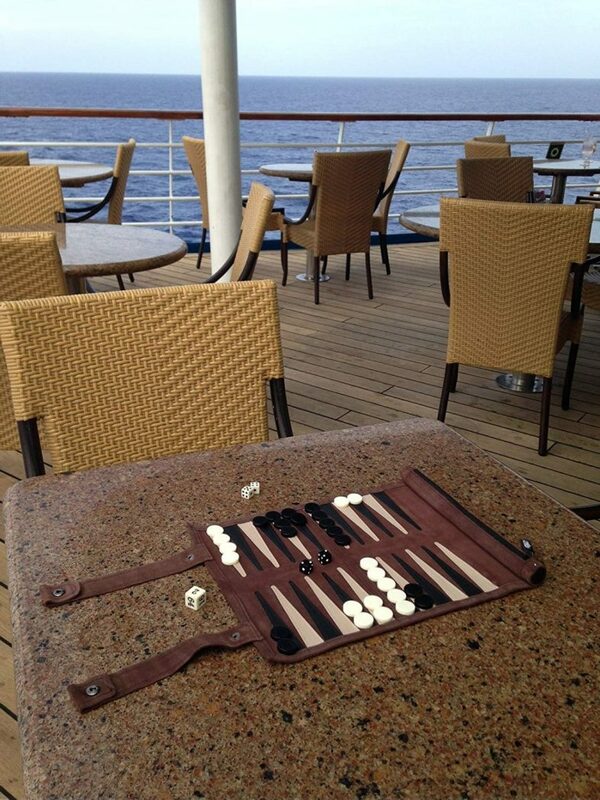 This makes it a great travel backgammon set. The playing surface is in wood too and look beautiful. The patterns on the surface looks great, the colour contrast between the points are just perfect. This wooden backgammon board come also with two of 15 wooden checkers, four dice, one doubling cube, and two wooden dice cups. The dice are just a bit small and the checkers a bit lightweight for my liking. The dice cups are also a bit shallow but I suppose for a travel backgammon set, this is alright as you want something compact and transportable. And you can always pickup some other precision dice if you really want too. 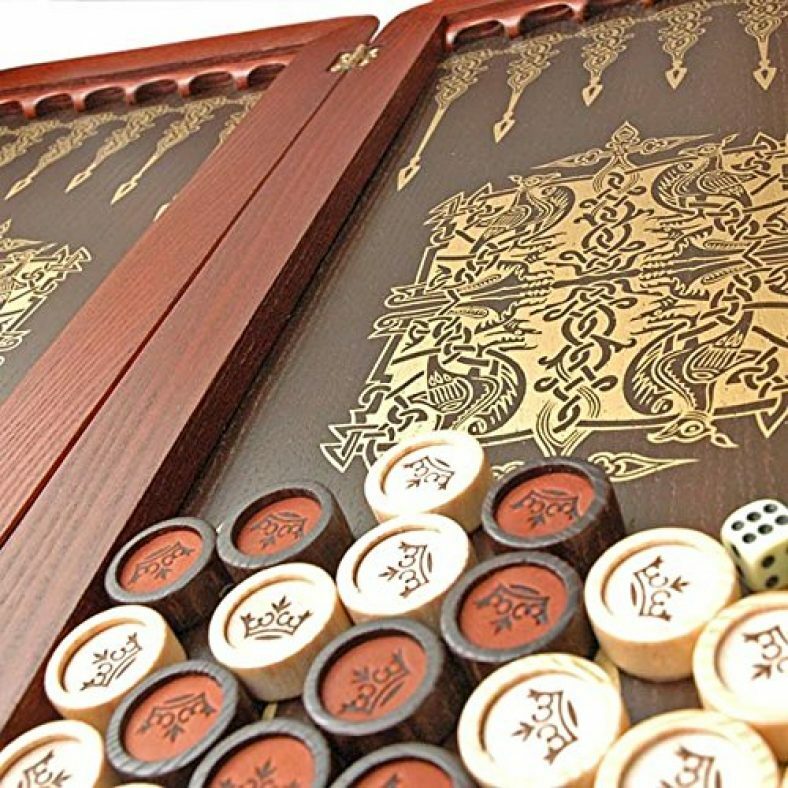 This wooden backgammon board might not be the best wooden backgammon board out there but for the price you pay, I think it is a really good backgammon board, and it is a beautiful one too. It is compact, you can easily bring it with you wherever you go to play your favorite game! 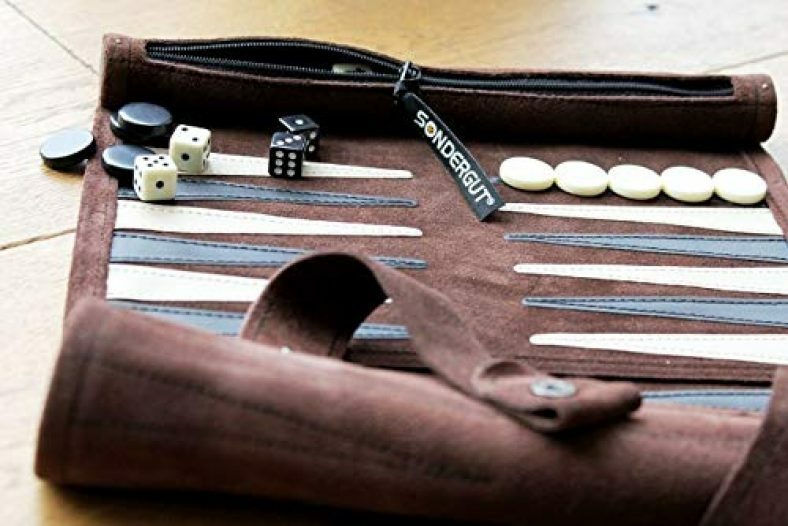 This leather travel backgammon board is made by Sondergut, a German company specialized in roll up travel games. 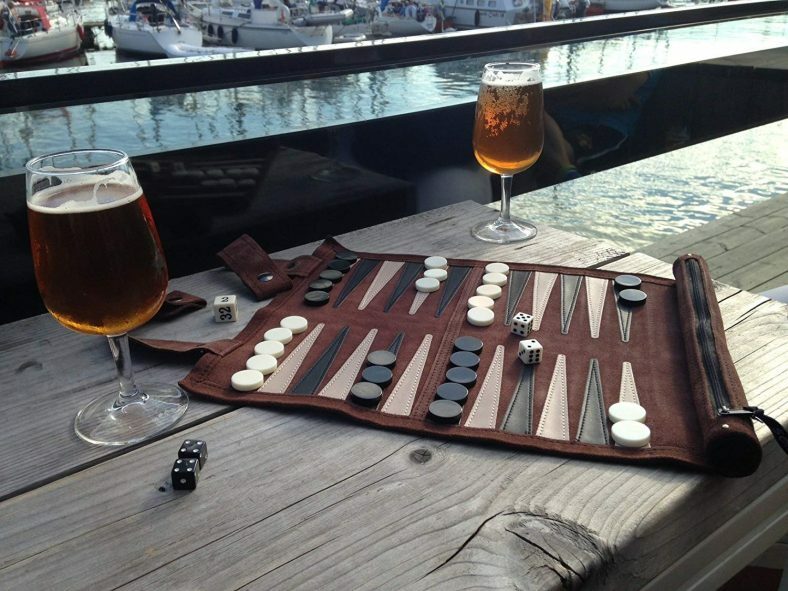 I tough I would mention it in my list of best backgammon boards because it is such a great idea and I love the concept. It looks amazing too! 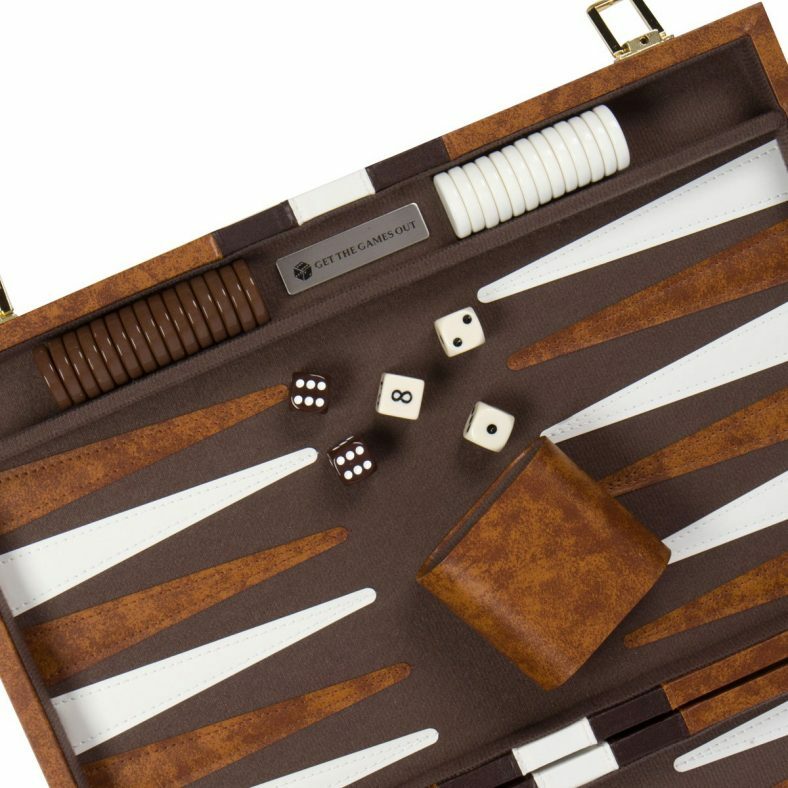 Once rolled up, and closed with the heavy duty snap on the strap, the Sondergut travel backgammon board is no bigger than a pocket umbrella. So you can take everywhere you go on vacation, at the beach, at the campsite or even on an airplane tray. And you if want to play backgammon after your long hike in your tent, no problem, it will easily fit in you backpack. 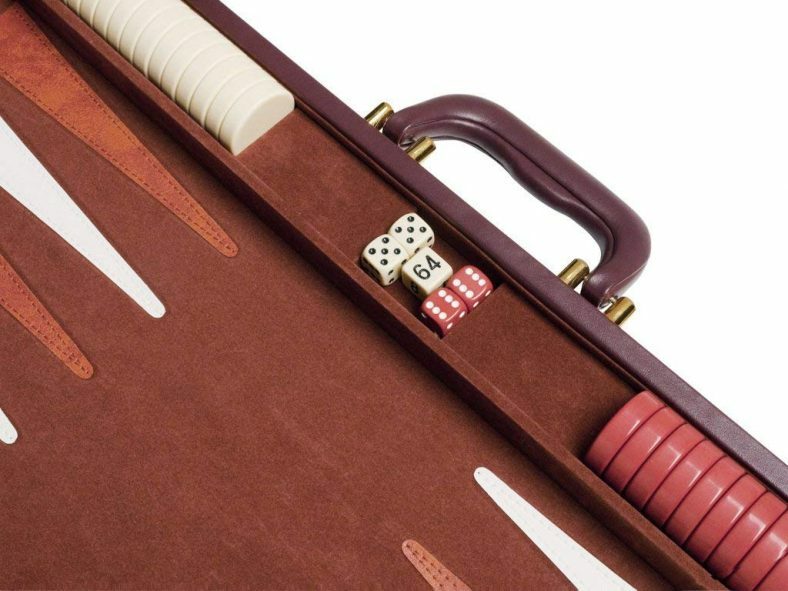 This travel backgammon board is very light as it weighs less than 1/2 pound but still is made of highest quality materials: it is hand-sewn, full-size board in rich mocha colored suede and has a rich look and soft, pliable feel. The games comes with a sturdy zippered pocket where you can store the games accessories: dice, doubling cube, two set of 15 checkers. It doesn’t come with dice cups but as a rolled-up travel backgammon set, you can easily understand why. 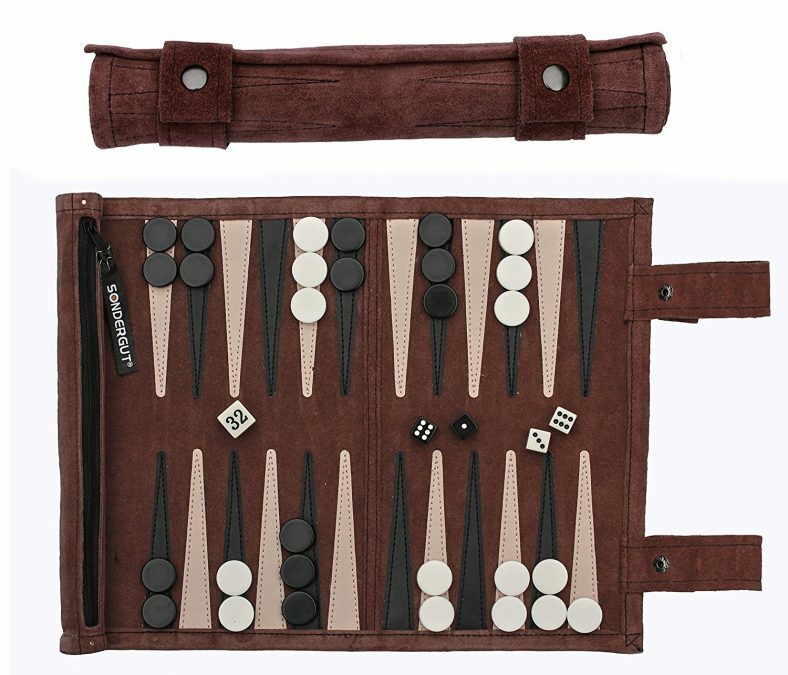 This backgammon board is probably the best travel backgammon board around: it is compact, doesn’t take a lot of space in your bag, it is lightweight, and it looks absolutely lovely with its very nice quality suede playing surface. How to choose a good backgammon board? Backgammon is a great game to play, whether you like to play it with your friends or family or even in a professional or semi professional tournament. 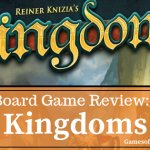 It is is a game that mix both luck (with the dice rolling) and skill. Obviously, the more you play, the better you will become at it.The more skill you have, the better chance you will have to win. Don’t know how to play backgammon? The price for a backgammon board can vary from less than $100 to several thousand dollars. 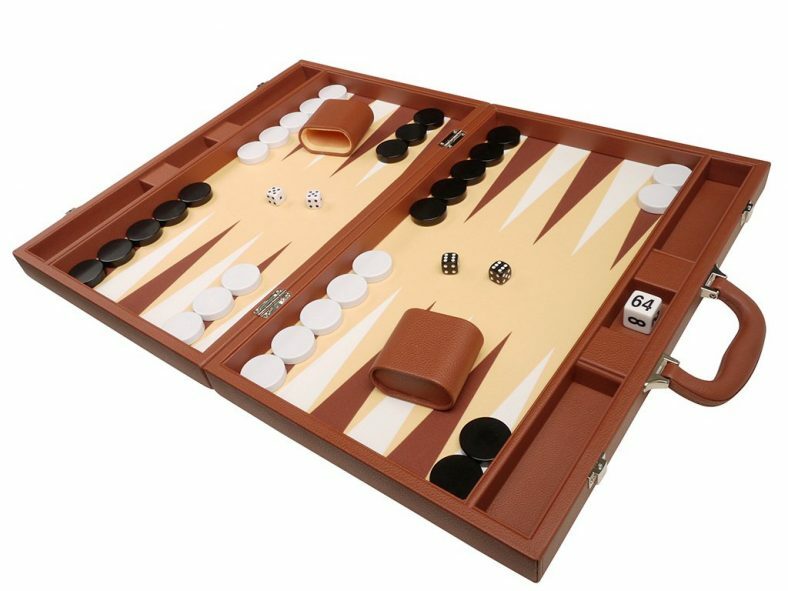 Backgammon board can be made with all type of materials, they can have all sort color schemes, and styles: leather backgammon sets, wooden backgammon boards,felt, cork or vinyl backgammon boards, tournament backgammon boards, portable backgammon set or travel backgammon board. If you are a beginner player looking for your first backgammon board or maybe a semi-professional backgammon player looking to upgrade, there are few things you need to take into consideration before buying your set. Backgammon sets have different design, they can be build using different materials and have different size. 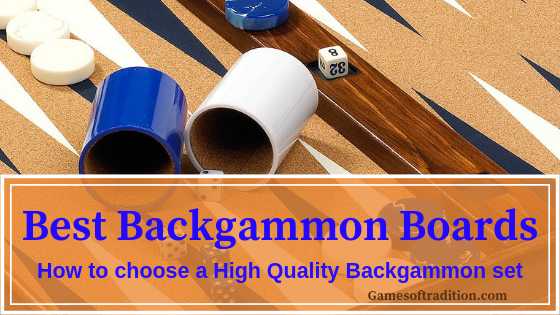 Looking at my top pick of best backgammon boards, you have certainly noticed that backgammon sets can have different type of design. 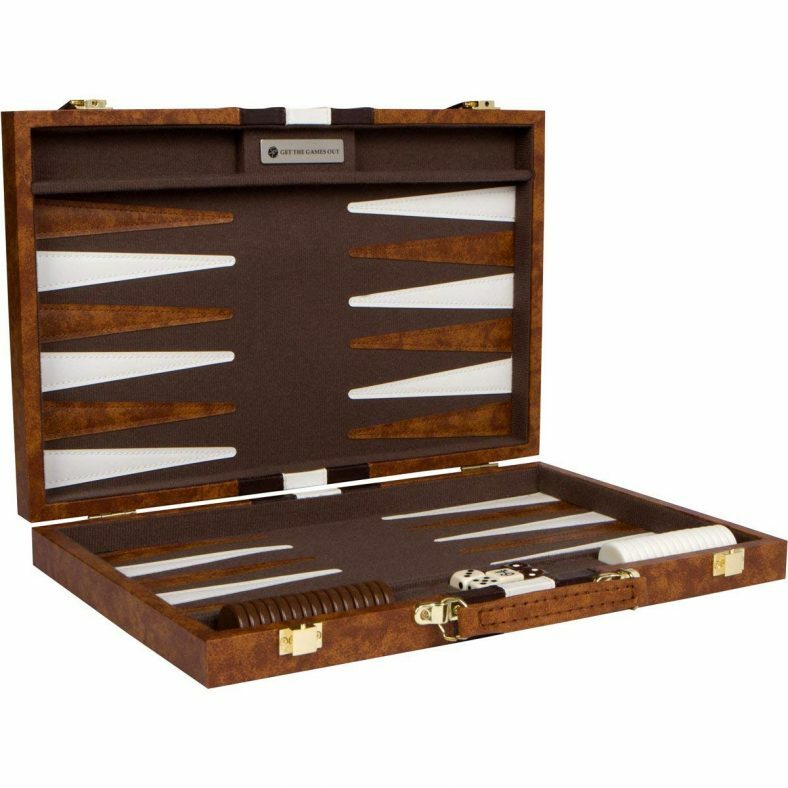 Probably the most common design for a backgammon board is the Attaché backgammon set: Attaché can fold as they have two hinges in the middle, a bit like a travel case. When you want to play you just open the case and play on the two open side. They have also a handle so that you can easily take it with you if you travel. 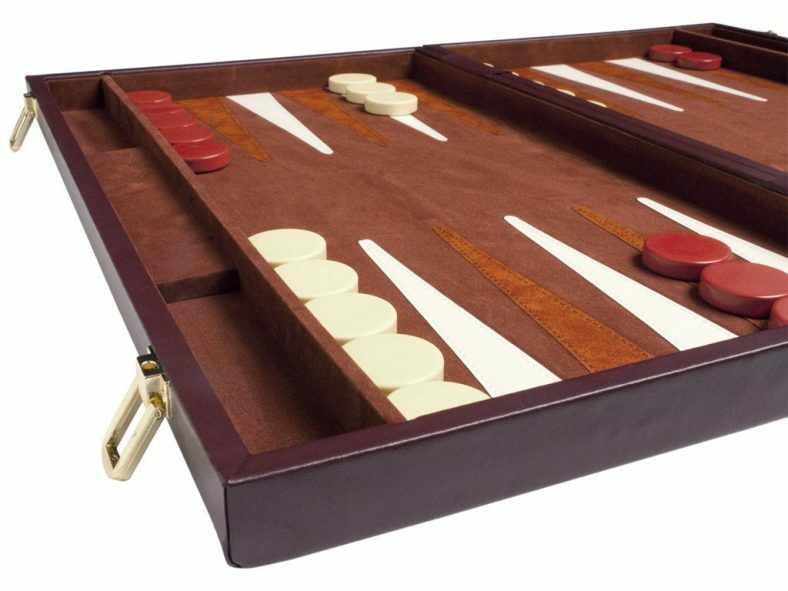 The advantage of those attache backgammon board is that they can be compact, light (depending of their size too) and transportable. A tabletop backgammon set is usually bigger than an attaché backgammon board. They are not design to be carried and are best if you are playing home. 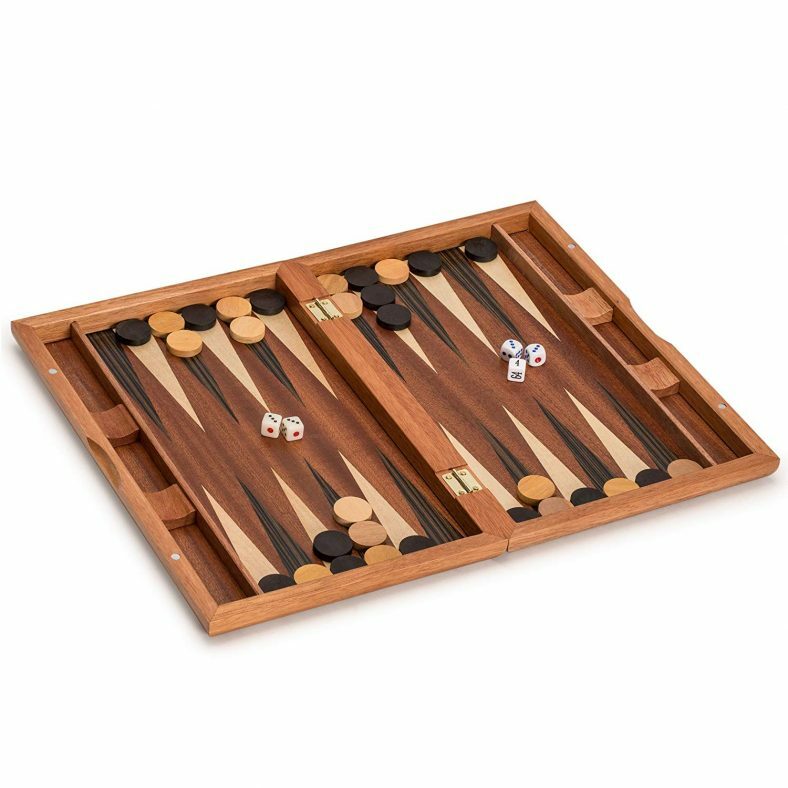 Luxury tabletop backgammon set will stand as a feature in your house, they be beautifully designed and crafted and you will no doubt want to expose them and show them off to people. 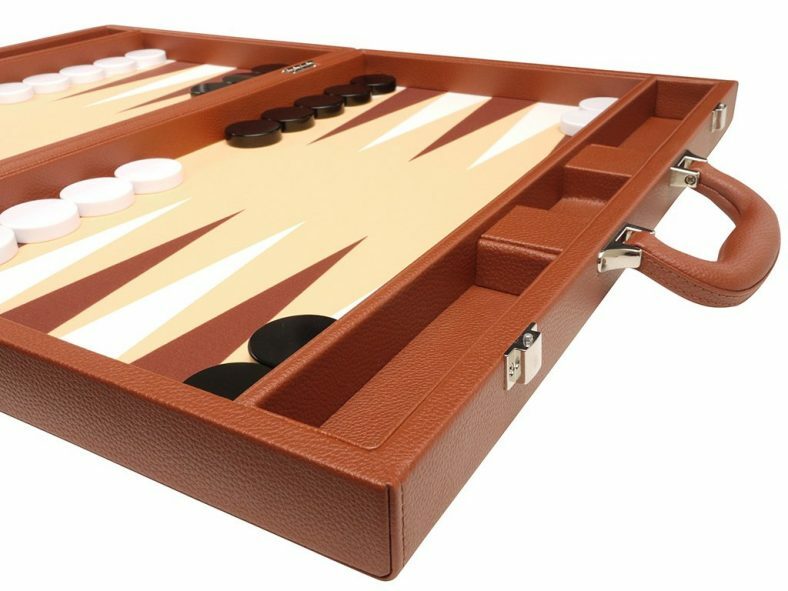 Some other backgammon board can literally be a piece of furniture, like a game table and make a beautiful and functional addition to your living area. It is only a personal matter and the choice is really yours. Buying a backgammon board made in wood or in leather or fabric really depends of personal preferences. You want you board to be easy to clean and durable. Those are the main differences you need to be aware of. Wooden backgammon board are often beautifully crafted, they look very nice and can have nice colors and intricate designs. Bear in mind that a wooden playing surface may suffers from scratches from the dice rolling and the constant sliding checkers. It can also be quite noisy to play on a wooden surface when you have a pair of dice hitting and bouncing on the wood over and over. A leather or a fabric backgammon set would be significantly quieter and the dice will spin for a shorter time. Some backgammon players are looking for some noise when playing, especially in the Middle east.Again, it is a matter of personal taste. 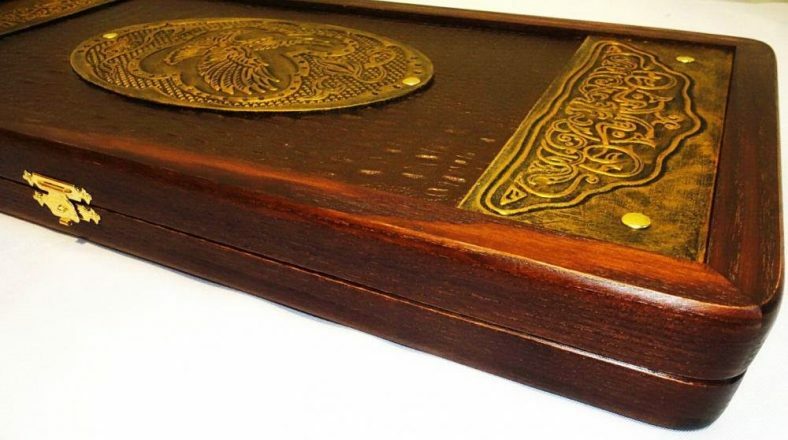 A Luxury Backgammon board made of wood like mahogany, ebony, briar, elm, and burl for example, is a beautifully handcrafted set that you would proudly show or expose in your house like you would with an expensive piece of furniture or even an expensive painting. When I speak about leather, felt or cork backgammon sets, I am referring to the playing surface. Some backgammon sets have a leather or leatherette case but a wooden playing surface. 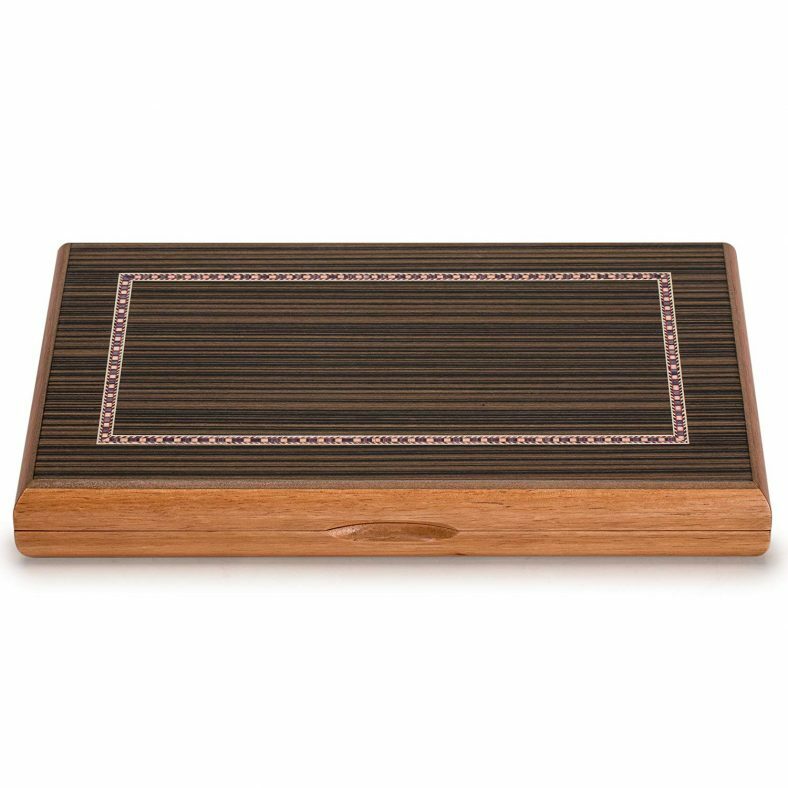 If you are playing backgammon in tournament or against semi-professional players, the last thing you want to buy is a wooden backgammon board. It is way too noisy. What you want is a s playing surface able to muffle the sound of the dice hitting the board. The dice also bounce less on that kind of material than they would on wood. You really want the right amount of bounce. There is different type of leather. The most expensive one is probably the shagreen, a very exclusive, rare and precious leather that most luxurious backgammon board are made of. It is considered by far the most resistant leather in the world and naturally so, the luxury backgammon boards that are made of shagreen are worth fortunes. You want a board big enough to be able to play comfortably. And when I say comfortably, I mean that you need enough space on the board to roll the dice fairy. You get less dice turn on a smaller backgammon board and that could ultimately lead to unfair dice rolling. 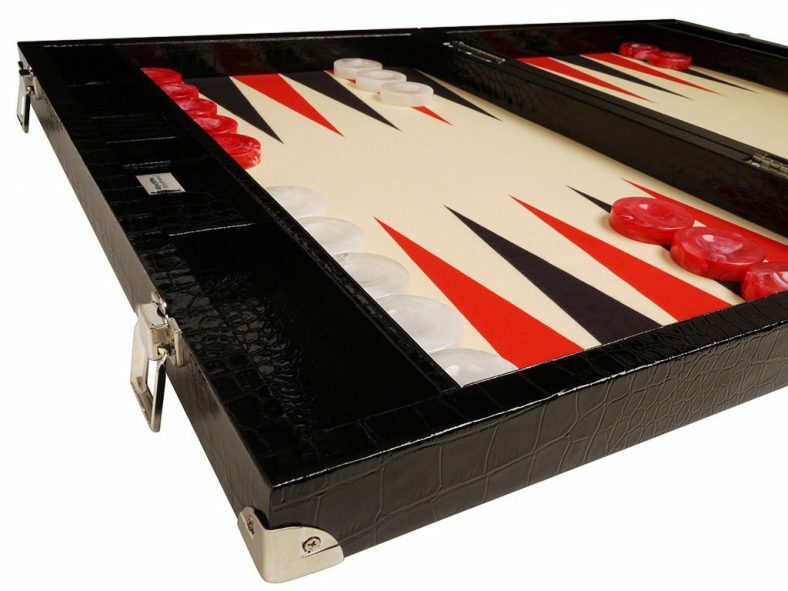 Tabletop backgammon board are often 26″, but the size of a backgammon can be 15”, 16”, 20” or 23”. 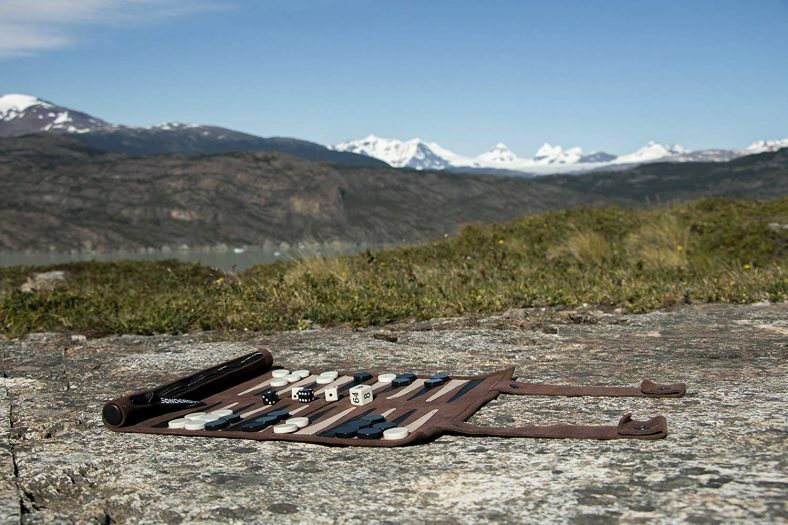 If you like to take your game with you on vacation, you need portable backgammon set, so you might be tempted by a more compact and light backgammon board. Checkers comes is different sizes and materials. Ideally, you want to have checkers with a suitable weight/ size ratio. It is a personal choice but myself, I prefer my checkers to be on the heavy side. Heavy checkers are less likely to move or slide if you backgammon set is knocked into accidentally in a middle of a game. Cheaper backgammon board tend to have plastic checkers that can fly away easily when you move the set or when the dice hit them. More expansive backgammon sets tends to have checkers made in heavier material like some sort or stone, Bakelite or pearl checkers. It is very important that the checkers slide smoothly on the surface. For that, try to avoid backgammon boards with vinyl sew on pips because they will get worn over time and they will prevent the checkers to glide on the playing field. In a good backgammon board, you will find that the checkers fit the pips comfortably. When you place 5 of your checkers on your six point, they should all fit with maybe just the tip of the point peeking out. Some boards come with checkers that are either to small or too wide and it can be confusing during a game. You may think that a pair of dice is just the same as any other pair of dice but if you do, I can tell you that it is far to be true. Dice can vary in quality. They can have different size, weight etc…and some are not very well balanced.When you play backgammon, you rely on a fair dice rolling. This is why you have precision dice: they have rounded corners so they can roll more, and also to ensure a more random roll. As a result, when you roll precision dice, each side has the same amount of chance show. None of the backgammon board on my top pick have precision dice, be aware that unless it says specifically that the backgammon board comes with precision dice, you can assume is doesn’t. You can pick up a pair of precision dice for $30. A good dice cup should be hollow enough, large enough, to allow the dice to tumble inside. Also, a good cup should have a trip lip so that when the dice hit the lip, it will come out tumbling and rotating, ensuring a fair dice rolling.